It is so important to get a good nights sleep, yet a shockingly high amount of us don’t get anywhere near the recommended eight hours a night. // Impair memory and cognitive function. // Increase risk of high blood pressure. // Bring a higher risk of diabetes. // Disrupt circadian rhythm which can lead to poor white blood cell health. // Increase calorie consumption which heightens the risk of being overweight. So how can you sleep well at night? Well, I love my bed, I love wrapping myself up in the quilt and propping myself up on a thousand pillows. I love the softness of my sheets and the feeling you get when you are drifting off to sleep. But until a couple of months ago I was a complete failure when it came to sleep. I did try but every night I would turn into this hungry, scary wide awake thing. It was no joke, I was known as the gremlin in our house. Once I could keep still long enough to try and get to sleep my anxiety would tear its ugly head. My thoughts would race and I would lie there worrying for hours. After years of looking and feeling like one of the undead I knew something had to be done. I took a long hard look at what I could be doing wrong. Turns out it was a long list, it was a wonder I got any sleep at all. So I made some changes and slowly things started to improve and I began to sleep well. So if you are unable to sleep check out the easy steps that worked for me. They helped me get to sleep easily and also improved my quality of sleep. Caffeine is a stimulant and affects your body very quickly, it has a half life of three to five hours. It makes it extremely difficult to fall asleep and can delay the timing of your body clock. This will reduce your sleep time and affect the amount of deep sleep that you get. Limit yourself to three or four cups of coffee per day and avoid caffeine completely in the late afternoon and evening. I made the switch to decaf and although it contains a small amount of caffeine it isn’t really enough to stimulate your body. This had made a huge difference to me but if you are going to do this please follow these steps to avoid withdrawal symptoms. Day One - Take a container and mix 75% caffeinated and 25% decaf. Drink this for 2 days. Day Three - Mix 50% caffeinated and 50% decaf. Drink this for 3 days. Day Six - Mix 25% caffeinated and 75% decaf. Drink this for 2 days. Day Eight - Switch to 100% caffeine and there you go, you are (almost) caffeine free. Establishing a regular sleep pattern, sleeping and waking at the same times every day allows your circadian rhythm to operate at its best. Cortisol and adrenaline are released about an hour before you wake up which prepares your body for being awake. Keeping a regular schedule will assist you to be naturally ready when the alarm goes off. If your circadian rhythm is thrown off due to an irregular sleep schedule then you are likely to be in a deep sleep when the alarm goes off. This results in the morning grogginess that we all dread. As tempting as it is, try not to hit the snooze button. The short bursts of sleep you get from doing this are not good quality and could upset your rhythm and confuse your body. To help you fall asleep gently and wake up naturally this amazing alarm clock will act as a bedside light then gradually reduce to darkness to aid sleep. In the morning the light will start to brighten 30 minutes before your alarm goes off, bringing you gently out of a deep sleep. Getting at least 30 minutes exercise per day not only gives you more energy through they day, it also helps you sleep much better at night. Exercise can contribute to a more deep and restful sleep. There are many benefits to this deep sleep, a boost to the immune system, support to cardiac health and a reduction in stress. When you are physically active you burn energy. Which helps you to feel more tired and ready for sleep. Exercise can also help anxiety and depression. Mind body exercise such as yoga can help quiet the nervous system which helps you relax. Taking a warm bath about 2 hours before you go to bed is a really good way to relax your body before sleeping. Use calming scents like lavender or jasmine and soak for 20 or 30 minutes. I got this Weleda Lavender Relaxing Bath Milk for my birthday. It is so luxurious I only use it once a week on pamper night. Another great benefit is that your temperature drops at night. So raising your temperature a degree or two in the tub will cause a steeper drop. The rapid cool down period will relax you into a peaceful sleep. It is now so easy to stay connected to the internet 24/7 and a smartphone is a huge temptation to browse whilst lying in bed. But doing so brings a higher risk of insomnia. Smartphones, tablets, laptops and televisions emit something called blue light. This is a type of light that our brains will interpret as daylight. The blue light will surpress melatonin which affects circadian rhythm and should be increasing at bedtime. The end result is that your brain is stimulated which makes it incredibly difficult to fall asleep. Give yourself a technology curfew. An hour before bed should be fine. Try to keep your phone out of arms reach, so you are not tempted. After your technology curfew you can use the time before sleep to read a book. Reading for 10 - 30 minutes before bed can have a really positive effect on your brain. Reading gives your brain a workout, which keeps it healthy and more able to do what needs to be done to give you a good nights sleep. It greatly reduces stress levels, calming your mind for the night ahead. Reading also helps your body to calm down and is easily slotted in to your bedtime routine. As an added bonus reading can improve your cognitive skills, the ability to retain information and have longer lasting memories. This one is my favourites. There are various techniques you can use but one day I will dedicate a whole blog post to it. Today I will just share the one that works for me. 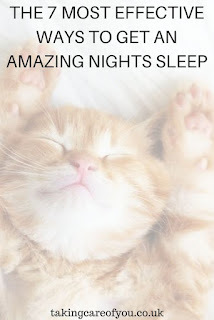 There you have it, 7 very simple ways to help you sleep well tonight. What works for you? Let me know in the comments. Wow! Such useful tips and I must agree with you that caffeine doesn't do anybody good. Very good advice! Some of these are hard for me to remember! Such great tips! Sleep is so important, not everyone knows how important it really is! Great tips! Especially the relaxation technique. I think a little relaxing, breathing exersizes can make a big difference! Yes, great tips. I will add one more: eat enough foods in the afternoon, lol. That will make we sleep easier and faster. 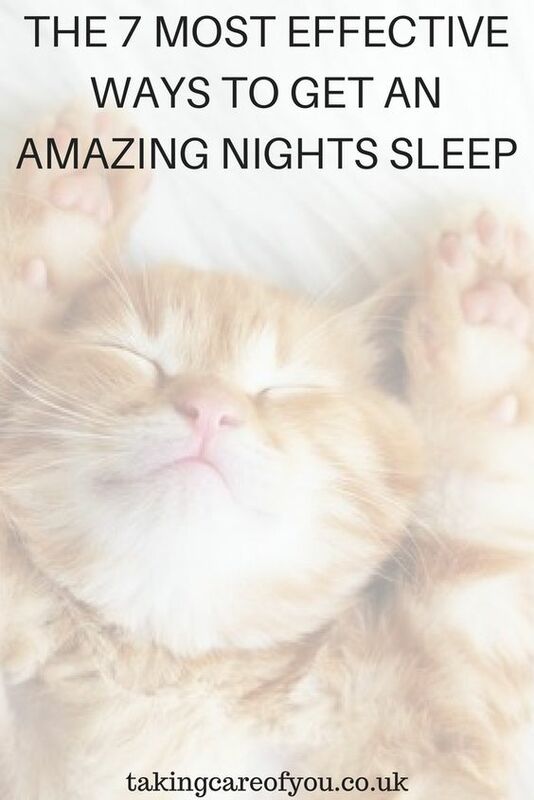 There is nothing better than a good night's sleep!! These are such great tips! I couldn’t agree more, we have to prioritize sleep for our health! What great suggestions - Thank You so much !!! I love that you give instructions on how to eliminate caffeine! I still haven't been able to do it. I think my worst habit is the tech before bed. I often fall asleep to the sound of the tv (I cannot remember a time when I didn't have trouble falling asleep- dating back to kindergarten!). All of these are such great tips and I'm going to take this as a reminder to unplug before bed! Sleep routines, good food and healthy habits all have a positive impact on your sleep. You offer some great tips herein.